Bradnams windows and doors started from humble beginnings, over 35 years ago in a Hervey Bay backyard. Much like Macrack they have grown over the years and now employ over 900 people, have branches all over Australia and Supply to the whole Asia Pacific area. Bradnams manufacture doors, windows and all other types of joinery, ranging from standard ranges through to fully customised solutions. They still manufacture in Australia, as it is more economical and time saving than to import from overseas. Especially when clients have a huge varying scope of requests that requires flexibility. Macrack has paired with Bradnam’s over the years to develop the perfect solution for their storage needs. 30 years of working together has allowed both companies to gain an understanding of each other’s work and allows for strong in-depth knowledge of what is required and how best to achieve a solution. 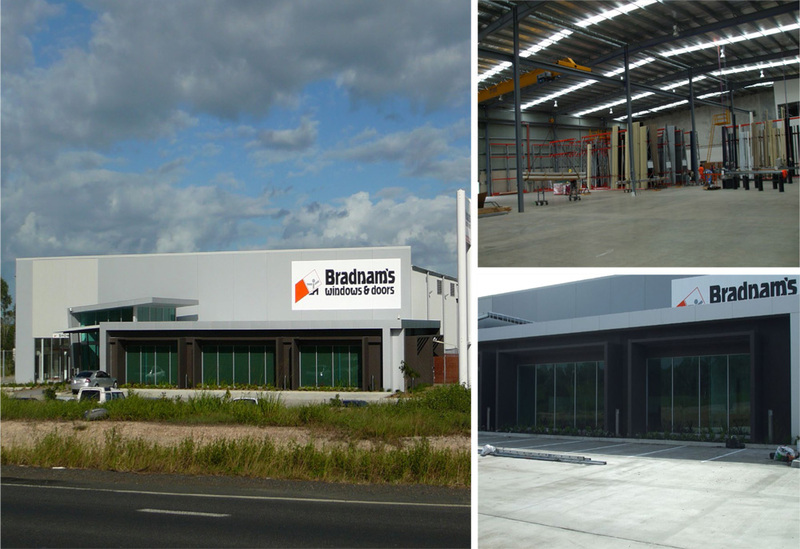 Bradnams now have branches all over Australia including a Brisbane showroom located in Boondall. The raw product being stored in these warehouses is extrusions of aluminium. These extrusions are generally light weight and come in 6m long lengths, however since they are handpicked to order, it’s not practical or feasible to store them in cantilever racking. Especially when there are hundreds if not thousands of extrusion options depending on colour, profile, type etc. So Macrack has introduced the most appropriate storage solution for Bradnams and that happens to be A-frame racking. 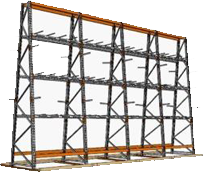 A-frame racking is designed to have long product lean against the structure in order to store it vertically, much like the angles on the letter ‘A’. This system of storage is beneficial to storing long product as it stands on its end which means that the floor area required to store the product is reduced because the product is occupying height, not width or depth. Secondary benefits to A-frame is that the product can be readily accessed by hand, picking small amounts of product to suit individual orders, this is in contradiction to cantilever racking where you have to pick a whole pack of goods, with a forklift. The Macrack A-frame system is able to have as many or as few separations going across the bays in order to distinguish the product where needed. It may be that you want a separation every 30mm or every 500mm, the choice is yours. Different heights in product or product that has been cut down (from another order) can still be stored in the system, because you can have separations bars set at many heights depending on your requirements. This is great to keeping order in the warehouse, and minimises waste of shorter product. A-frame storage systems have the ability to grow in length as your business grows. We call these addition’s “Add on bays”, where another section of racking can be added onto the existing section. So instead of investing a large amount of equity in the initial stages of your company, you can be rest assured that the storage capability can grow as your business grows. This is the same for additional warehouses, or relocations. We can match what you have on site or simply pick up what you already have and relocate it. This maintains an order of stability in your operations and allows for smooth transitions much like Bradnams have done over the years. If you think A-frame is the right system for you, ask Macrack for a price. We can give you the system that you want and you need, to make sure that storage is one factor you don’t have to worry about.